fire dance, originally uploaded by kenterong. 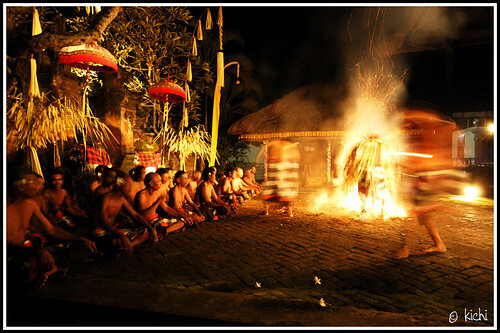 the fiery end to the whole kecak dance that night. i didn't really realize the guy was in a trance until the priest sprayed some holy water on him, as he was held down by his friends. that explained why he was so eager to get into the flames, with little regard for his own safety. Uploaded by kenterong on 16 May 07, 9.02PM ICT.